Each month we host a Graphic Novel Book Club meeting, open to all, during which we hang out and informally discuss a featured graphic novel. 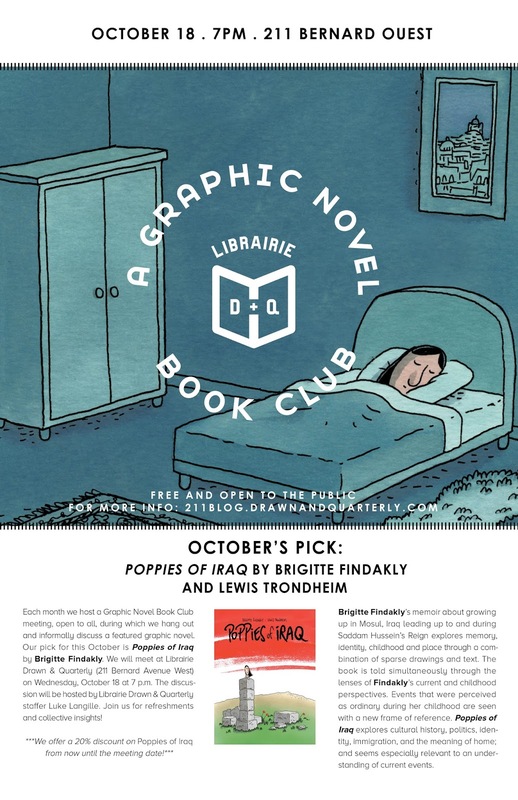 Our pick for this October is Poppies of Iraq by Brigitte Findakly & Lewis Trondheim! We will meet at La Petite Librairie Drawn & Quarterly (176 Bernard Avenue West) on Wednesday, October 18th at 7 p.m. The discussion will be hosted by Librairie Drawn & Quarterly staffer Luke Langille. Join us for refreshments and collective insights! Findakly’s memoir about growing up in Mosul, Iraq leading up to and during Saddam Hussein’s Reign explores memory, identity, childhood, and place through a combination of sparse drawings and text. The book is told simultaneously through the lenses of Findakly’s current and childhood perspectives. Events that were perceived as ordinary during her childhood are seen with a new frame of reference. The book explores cultural history, politics, identity, immigration, and the meaning of home, and seems especially relevant to an understanding of current events.